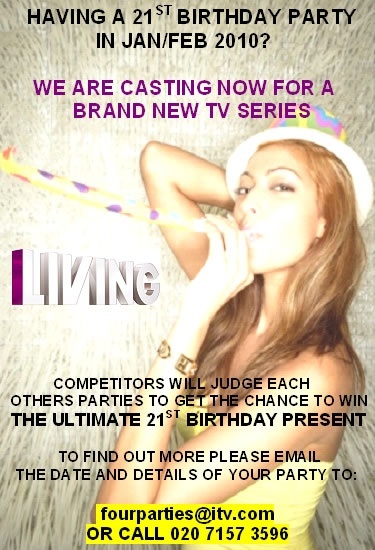 ITV have approached us and are producing a new series for LIVING TV following their hit show FOUR WEDDINGS. It's a brand new sister series, but this time its birthdays. Think 'Come Dine With Me', birthday party style! The series is kicking off with 21st parties, and the winning party walks away with a dream present – after all four birthday guys/girls have judged / scored each others. It’s not just an amazing opportunity, but a great souvenir of the event. Just one condition! The event must take place in January or February 2010.